Contact Lens Wearers As mentioned here, contact lens wearers will benefit from removing their lenses prior to using bi-phase eye makeup removers, as these can at the worst damage lenses, and at the least, leave a film on the surface of the lenses. Lancôme Bi-Facil Non-oily Instant Cleanser. This really is the daddy of all eye makeup removers. It removes all eye makeup easily and doesn't leave an oily residue. It is especially good for waterproof mascara and usually one cotton pad per eye is sufficient. However, it's not cheap. I'm using up a rather nice stash of this as I got a lot of this free with a bunch of Lancôme purchases in the last few months (otherwise it's about €29). Neutrogena Oil-free Eye Makeup Remover. A very close second place, much cheaper than the Lancôme offering but difficult to get in Ireland (I bought it in the 'States). Feels very soft on your skin but leaves your lids a little oily. Irritating packaging; it doesn't have a nozzle, so you can too easily spill out too much of it. I think this cost me approx €7. 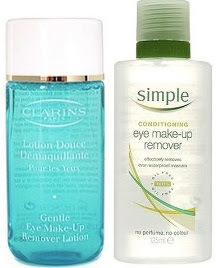 Clarins Instant Eye Makeup Remover. My previous favourite, before I got a bunch of Lancôme for free and before I trialled the Neutrogena. This costs around €24 so it's not cheap, and you need to use a few swipes of it to remove everything, but it does the trick and doesn't leave an oily residue. Sephora Waterproof Eye Makeup Remover. Also not readily available in Ireland, so I tend to stock-up when I'm in a Sephora country. This is not expensive, around the €7 mark. My only complaint with this is that it can be very slightly drying on the eyes and can leave a white cast. Boots Botanics Soothing Eye Makeup Remover. This is a nice, inexpensive offering (around €5) that ticks all the boxes, removes heavy duty eye makeup but feels a tiny bit on the heavy/greasy side. L'Oreal Gentle Lip & Eye Makeup Remover for Waterproof Makeup. This does the trick but takes a few goes and stings my eyes after a few days' usage. I'll use it if there's nothing else available, because it does work, but I'd rather not have to. Around the €8 mark. Johnson's 3-in-1 Eye Makeup Remover. Cheap as chips (about €4) but dries my lids out, which is a shame, because it really does work. No7 Cleanse & Care Eye Makeup Remover. About the only thing useful is the pump dispenser. I have thrown the makeup remover out and replaced it with the Neutrogena one (which is great but doesn't have a dispenser spray or nozzle). No7 skincare is nowhere near as cheap as it used to be, and as the only thing useful is the pump, it works out as an expensive dispenser (somwhere in the region of €9/€10). Bourjois Express Eye Makeup remover. This is beyond total and absolute rubbish. The two liquids don't mix together very well, it takes multiple goes to remove anything; I gave up and switched to one that I know works rather than continuing to dab away at my delicate eye skin. It also caused my eye to feel raw afterwards (but this may have been down to the repeated use required to make it work). I can't remember what it cost, but it's irrelevant because it's totally useless. Prior to researching their ingredients, I had previously thought that most of my bi-phase eye makeup removers were oil-based, however have since discovered that in fact they nearly all are silicone-based. The only oil-based one that I've used is the Chanel Precision Gentle Biphase Eye Makeup Remover. This is really lovely; like all Chanel products it works beautifully, feels lovely on your skin, removes eye makeup effortlessly, and costs an arm and a leg. I love it, but on the basis of cost, I won't replace it; it's not as though it lasts longer than other removers. Micellar waters are technically a bi-phase product and can be used as makeup removers and also as a gentle eye makeup remover for sensitive skin or light eye makeup. See here for more information on micellar waters. DIY Bi-phase Eye Makeup Removers - Make your own! To make your own very effective oil-based bi-phase cleanser, mix together some oil and water. Use one of these oils: baby oil (which is essentially just mineral oil plus fragrance), or sweet almond oil, or coconut oil, or olive oil, or grapeseed oil. I add the contents of a capsule or two of vitamin e oil to the mix. To this, add some micellar water, distilled water or witch hazel (all usually available in a pharmacy. Note that witch hazel will make the mix a small bit more astringent). I also also add some rose water (calming, soothing, great gentle scent) and a tiny amount of aloe vera (gel, liquid, whatever you have). Essentially you want approximately one third oil and two thirds water. Put this into a clean, preferably sterilised, bottle. Shake well to mix and every time you want to use it. It works just as well as the cheaper brands and at a fraction of the cost! Generally these are water-based eye makeup removers for use on sensitive skin or eyes, or for removing very light eye makeup. These are great if you don't wear much eye makeup, or you want to use them as an eye toner, subsequent to your bi-phase eye makeup remover. They are, however, pretty much useless for more heavy eye makeup. Clarins Gentle Eye Makeup Remover. This probably has a slight edge in terms of how gentle it is. It never stings, it doesn't dry out your eyes. I use it to remove very light eye makeup but also occasionally I follow-up with this after my Sephora or Boots Botanics Bi-Phase eye makeup removers. Expensive though, around €24. Simple Conditioning Eye Makeup Remover (also known as Kind to Eyes Makeup Remover). This is a very close second. It is gentle, it is unscented, it doesn't sting, it doesn't dry your eyes, it will remove very light eye makeup, and it's much less expensive than the Clarins one at about €5. Lancôme Effacil Refreshing Eye Make-up Remover or L'Oreal Gentle Eye Makeup Remover for Sensitive Eyes or Rimmel Gentle Eye Makeup Remover or Nivea Visage Extra Gentle Eye Makeup Remover or Sephora Instant Eye Makeup Remover. These are all much-of-a-muchness, the only differentiating quality is the price; the Lancôme is much more expensive than the rest. Many (but not all) oil-based, balm or melt type face makeup cleansers can be used in the eye area. See here for more information on cleansing oils and other similar cleansers.